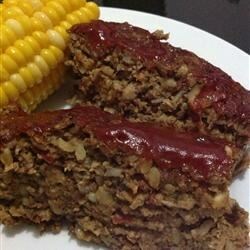 "This is a different and delicious veggie meatloaf that's a nice diversion from the basic soy protein based veggie meatloaf recipes out there." Heat the olive oil in a large skillet over medium heat. Stir in the mushrooms, onions, and bell pepper; cook until the onion is transparent, about 5 minutes. Sprinkle sage over the vegetables, and cook until vegetables are soft, about 5 minutes more. Transfer vegetables to a large mixing bowl. Stir the rice, walnuts, onion soup mix, oat bran, wheat germ, egg whites, Worcestershire sauce, and mustard into the mushroom mixture until thoroughly blended. Spoon into prepared loaf pan, pressing down mixture with a spatula to flatten top.